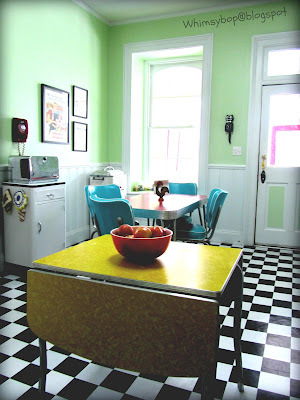 Whimsybop: Collecting kitchen tables: Chrome + Formica = FUN! Collecting kitchen tables: Chrome + Formica = FUN! There's nothing like a bright red formica table to welcome back-door friends into my kitchen. 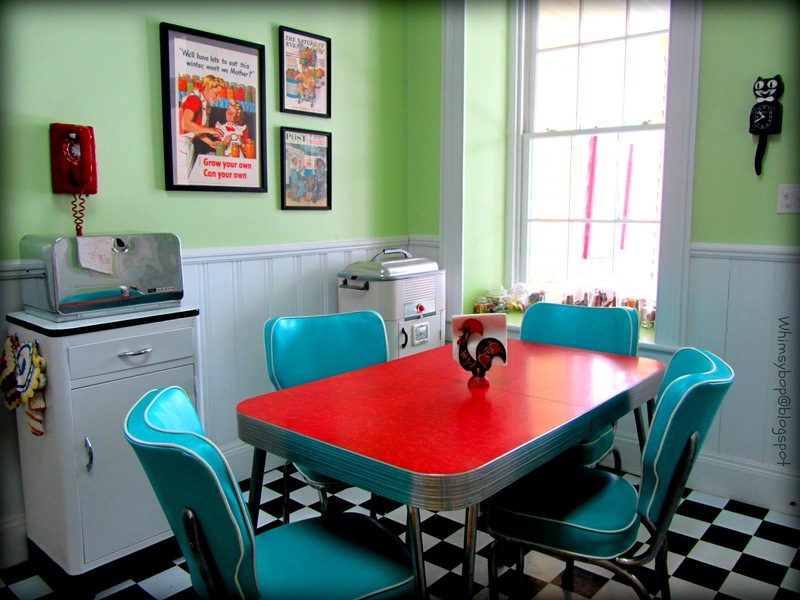 I adore these old dinette sets from days gone by and I'm drawn to them just as a small child is drawn to collecting rocks or seashells. Through the years, I have gathered a small collection of these kitchy darlings in various shapes and sizes, but, due to their size, it is impossible to display them all at once. Because of this factor, there are some tables that lie in wait in the closet beneath the stairs. Their "coming out" party will probably be when my kids leave the nest and are in need of furniture for their first apartments - no problem, I've got 'em covered. My decorating tastes have evolved considerably since my husband and I were newlyweds in the late eighties; believe it or not, I started out with wicker baskets, bunnies, geese & gingham. After a few years of marriage and a move to southern California, my decorating tastes morphed into out-of-control Coca-Cola craziness, which I blame on visiting the Coca-Cola Museum in Atlanta, Georgia on our trip cross country. We got our first red formica & chrome table (pictured above), during those Coke years when our friends, Bo & Deb went antiquing in Pennsylvania. Bo found it in the hayloft in a barn turned antique shop under a pile of hay, and, knowing that I was in the market for one, he called us in California and the rest is history! It's the table my kids will probably remember most when they look back on their childhood. A couple of years later I introduced pinks, aquas, yellows and greens to my home making it the pastel paradise that it is today. My next chrome & formica purchase was a large oval yellow table with funky chrome balls in the pedestal and a leaf that made a great extension when company came over to share a meal. I had the chairs reupholstered in aqua vinyl to match a set I saw in Mary Englebreit's Home Companion magazine, [let us pause for a moment of silence to remember my favorite magazine now out of publication...]. 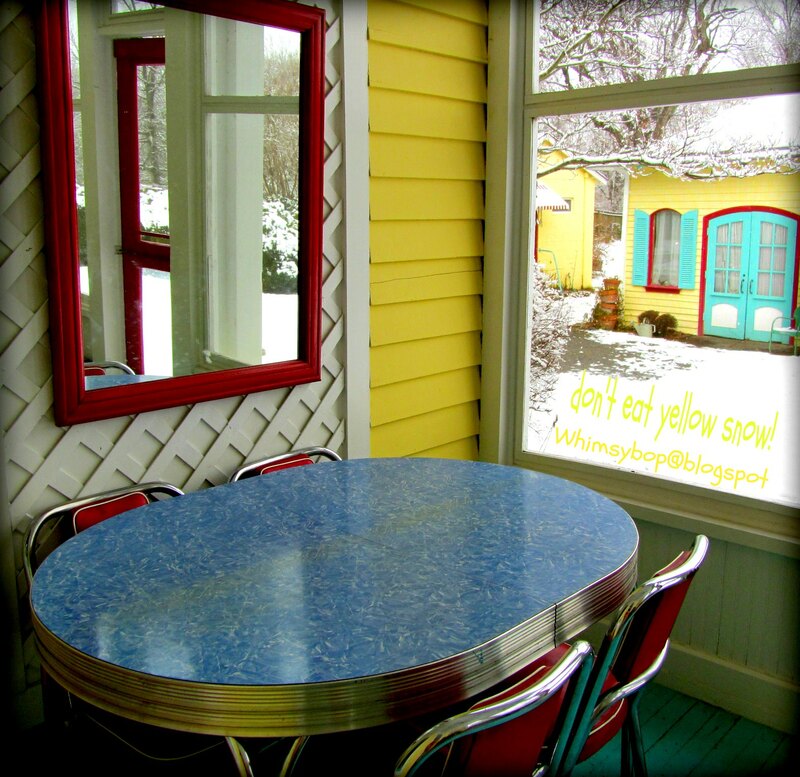 The groovy aqua chairs are pictured above around my red table, but the yellow table now lies in darkness in the closet beneath the stairs. My yellow drop-leaf table (pictured above) is currently my kitchen "island" and I love it dearly. My daughter and I found it on our first trip to the Hillsville Flea Market in 2009 and purchased it from a vendor who came all the way from Ohio. I still remember the "walk of pain" my 13 year-old daughter and I endured as we carried it uphill for at least a half mile until our fingers were numb and calves were mooing in pain - a great memory now, but not so fun at the time! 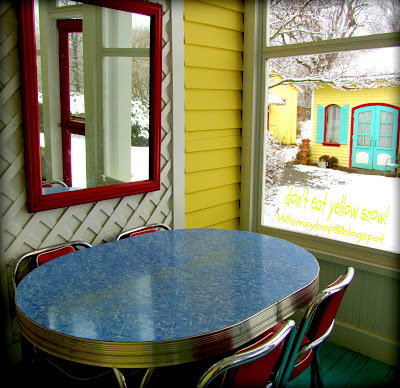 The blue oval one that currently sits on our back porch (pictured below) was purchased at an antique shop in the adorable town of Elizabethton, Tennessee. I paid much more than I should have - but it's BLUE, and blue is not an easy find, so it was worth it to me. I now have all the colors that I need, (two greens and another yellow are also beneath the stairs)...but I still have one more color to go - a PINK one! I saw one once when I was antiquing, but it was way too pricey for my budget so I passed on it. I still have dreams about it, beautiful pink dreams of the one that got away! I don't know what it is about the intense colors of formica and the shiny polished chrome that have forged such an enduring place in my heart. Maybe they remind me of an era that could have been mine if I was just born a decade or two sooner. They remind me of the days of Lucy & Ethyl scheming up a plan or playing Bridge with Ricky & Fred, or of Aunt Bea serving up pot roast and apple pie to Andy & Opie. An era when folks sat around the kitchen table peeling potatoes and snapping beans, when it was fashionable to wear an apron and when it was okay for women to be housewives and raise their own children. A friend of mine, who is in her 70's, visited my home and couldn't stop raving about the kitchen; she pointed out all of the various items that were in the room that were similar to her childhood home, including the chrome & formica table and chairs. It was fascinating to hear the details of her childhood that each item in the room had brought to her mind. We enjoyed a lovely afternoon of recollections from her past, and after she had left, it dawned on me that my children will have those sorts of memories too, but over a half century later - Wow! Talk about messing with someone's head! Hopefully our children will have fond memories of their childhood too; talking, laughing, reading devotions, playing games, shucking corn, enjoying pot roast with mashed potatoes & gravy - all those blessings that bring a family together around a kitchen table, no matter what the table may look like. Wow, that red one is FABULOUS! I've never heard of anyone with this collection before. I don't know if it's more of a sickness than a collection! Ha! I guess we all collect things we are drawn to - I must have been a squirrel in another life since I'm drawn to shiny chrome! I love your tables and chairs, TJ! Can't wait to sit at one with you in your house one day. One of these days I'll make you a mocha right here in my kitchen if I can ever get you out of Seattle! Wow! I have found a kindred spirit! Haven't you thought of hiding them under beds?? I have five kids... And they all have tables. Some of which are still n hiding. This made my day.